Low Fell History, Felling History, Dunston, Wrekenton, Lamesley, NewcastleGateshead 21st century. 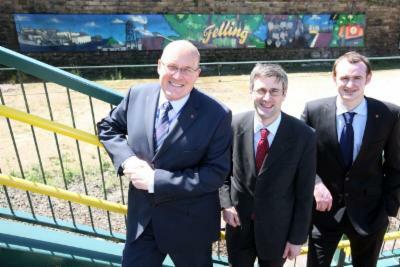 Gateshead formally submitted its bid for official city status, one of a number hoping to win the title as part of the Queen's Diamond Jubilee celebrations in 2012. If you have arrived here from a far flung corner of the World, Gateshead is part of Newcastle Gateshead a passionate city and town sitting either side of the mighty River Tyne in the North East of England about 65 miles south of the English / Scottish border. And Cube Pit or is it Q? And did I mention Lobley Hill? Eliezer Adler, Founder of Jewish Community. David Clelland Labour politician and M.P. George Elliott Industrialist and M.P. Daniel Defoe, who did live for a time in Gateshead is remembered as the father of the English novel but it is a little known possible fact that his most famous novel Robinson Crusoe was possibly written in Gateshead. And Alice in Wonderland was partly written by Lewis Caroll, in the Ravensworth Arms, Lamesley. Christina Stead, the Australian author, set her only English novel, Cotter's England partly in Gateshead (called Bridgehead in the novel). other inmates were sadly burnt. On 27th May 1824 The Rev. 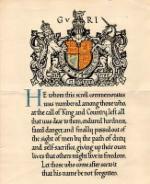 John Collinson, rector, the four-and- twenty, the churchwardens, and a great number of other inhabitants, accompanied by Mr. Forster, steward to Cuthbert Ellison, esq., M. P., lord of the manor, perambulated the boundaries of the parish of Gateshead. 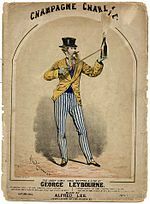 They commenced at the Blue-stone, on Tyne Bridge, at nine o'clock, attended by two constables with flags, and two excellent pipers, and were greeted at their departure by a salute of guns from Mr. Price's glass-works, and a peal of bells from St. Mary's church. They proceeded by the northern and the western boundaries to Wreckinton, where refreshments were provided for them, and music from an excellent band afforded amusement for the ladies in the festive dance. From hence the procession moved along the southern and eastern boundary to the river Tyne, where the constables and pipers took boat, and proceeded to the bridge. 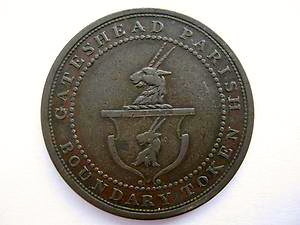 A number of medals were distributed on the occasion bearing on the obverse, within a circle of dots, the arms of Gateshead, round which " Gateshead Parish Boundary Token ;" and on the reverse, within a circle of dots, " The Rev. John Collinson, Rector," round which, " Perambulated 27th May, 1824." As there had not been a perambulation since the year 1792, a great number of persons attended. The perambulation ended at half-past four o'clock, when the party sat down to an excellent dinner, at the Black Bull Inn, Sir R. S. Hawks, knt., in the chair. Now there's a good idea. I write this on 27th May 2013 which is a Bank Holiday and would have been perfect for a perambulation by athletes for the boundary is now Crawcrook in the west, Bill Quay to the east and Birtley to the south. That's a canny hike, like! Simon Harrison and Alex Sandilands from AkzoNobel with Oliver Bratton from Tyne & Wear Metro.